The batter was really dry. I was a bit worried they wouldn’t settle into the muffin cups but I think they look cute. These were baked 18 minutes (the original ones were in for 25). In retrospect 18 minutes was not quite enough, I’ll try 20 next time. They were cooled in the pan 1 minute before being transferred to the rack. Now this is the fun part. 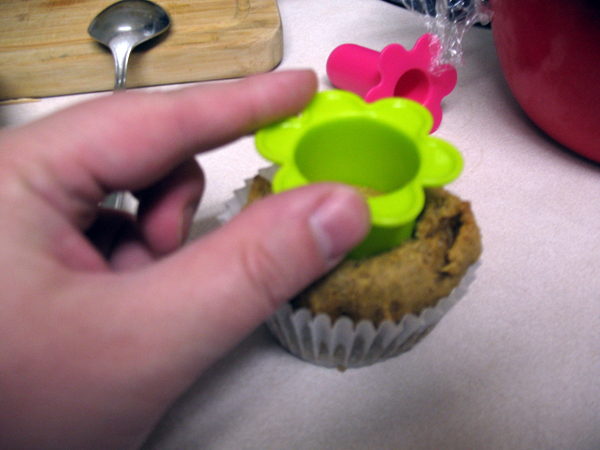 Use a cupcake corer (thank you M!) and stuff them with cream cheese frosting. Woah this thing works way better than a knife. Verdict: Hmm. I liked this much more than round 1. Boyfriend-Unit loved them. I think there is still room for improvement however, so next time I’ll up the pumpkin ratio a bit, and decrease the cardamom. 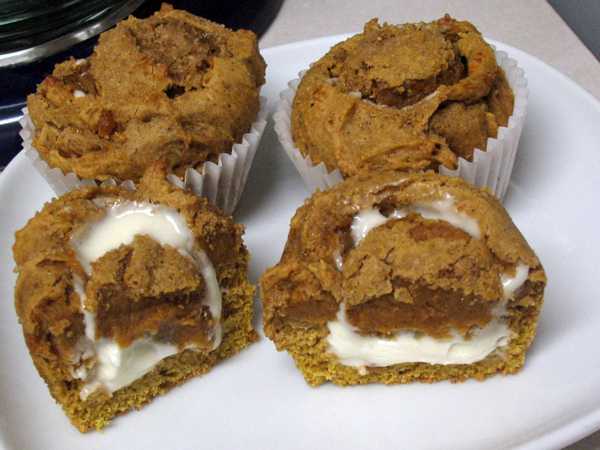 I decided to reverse-engineer a pumpkin cream cheese muffin after the underwhelming experience of buying one from StarBucks. 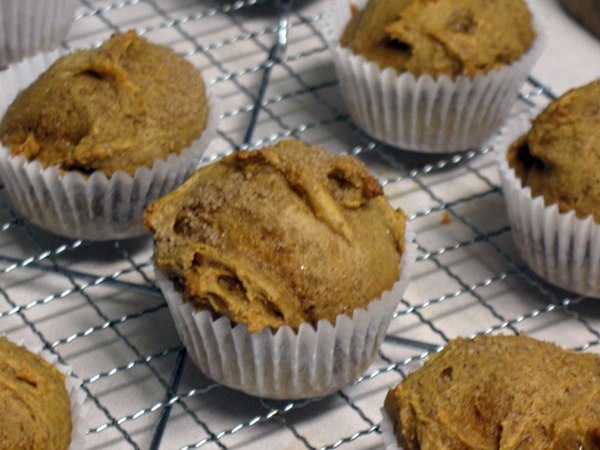 This is my first attempt at making pumpkin muffins, and I made them the morning after seeing Nine Inch Nails live, which really has nothing to do with making muffins, but there you go. 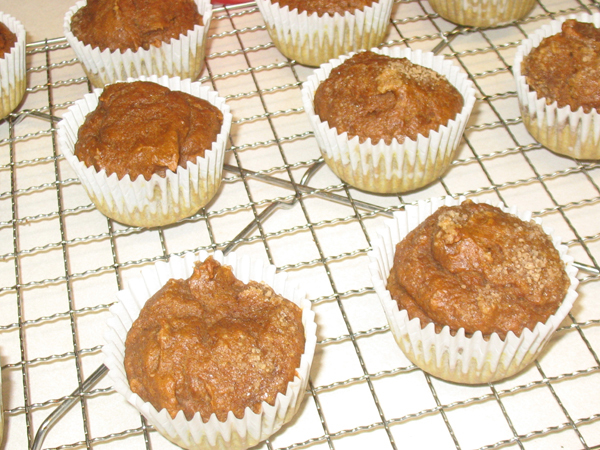 The muffins were edible, but have room for improvement. Trent Reznor, I am happy to report, does not require any improvement. I was surprised to see that the ingredient cost of this made this the most expensive thing I have ever baked, even steeper than the the Bailey’s chocolate cheesecake. Yikes. 1. Pre-heat oven to 350°F / 176°C and put muffin liners into pan. 2. 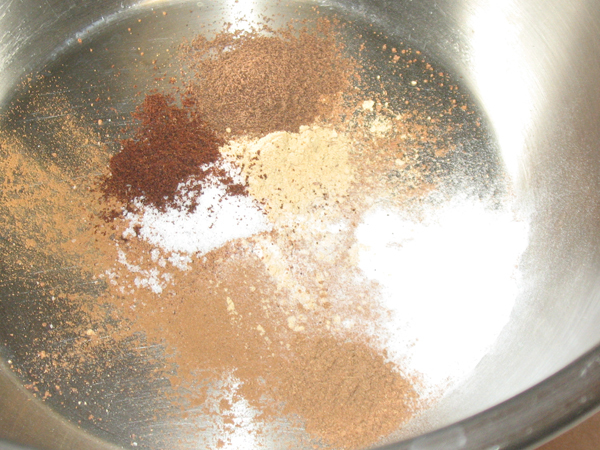 Combine in a bowl: flour and spices. 3. 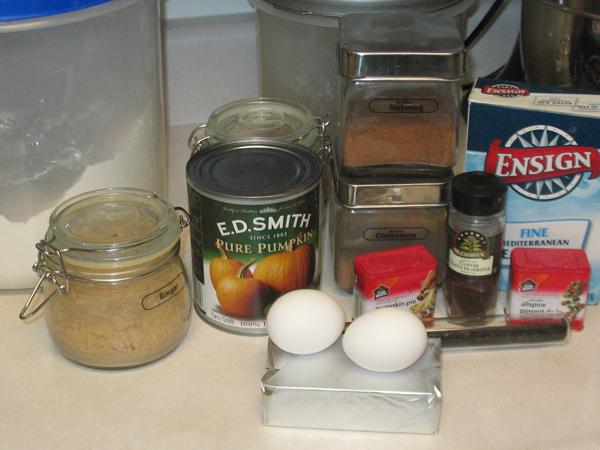 In mixer; cream the eggs and sugar until smooth. 4. 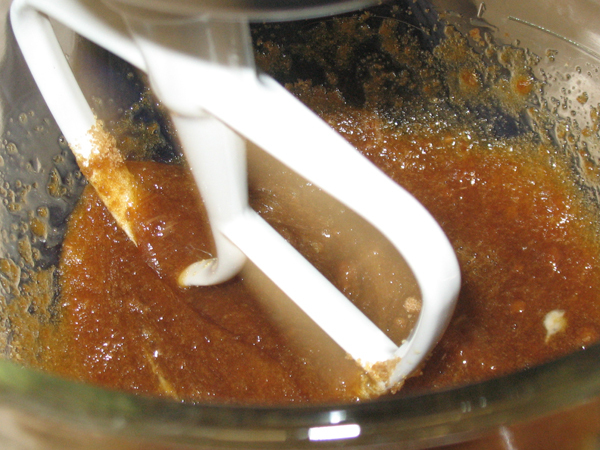 Mix in canned pumpkin, vegetable oil, and vanilla bean pods. (Reserve the shell for something else). 5. 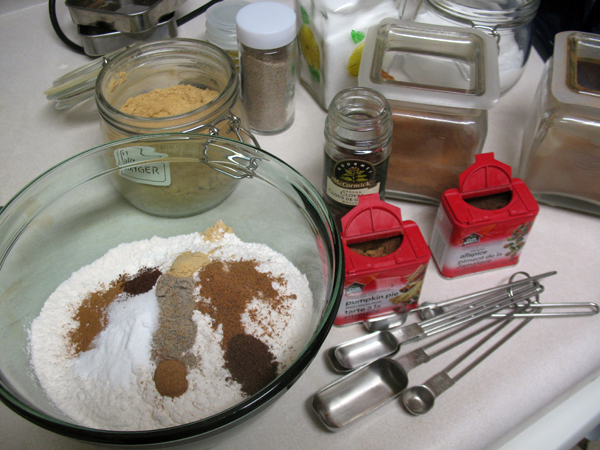 Gradually add flour mixture to wet, and don’t overbeat. 6. 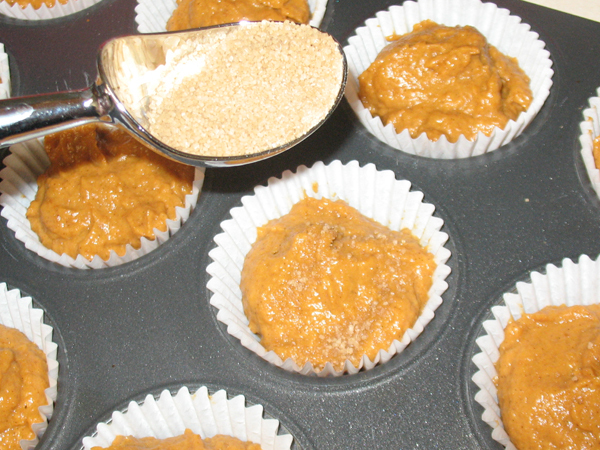 Spoon into tray, and dust with turbinado sugar. 8. Cool in pan 5 min before transferring to rack. 9. 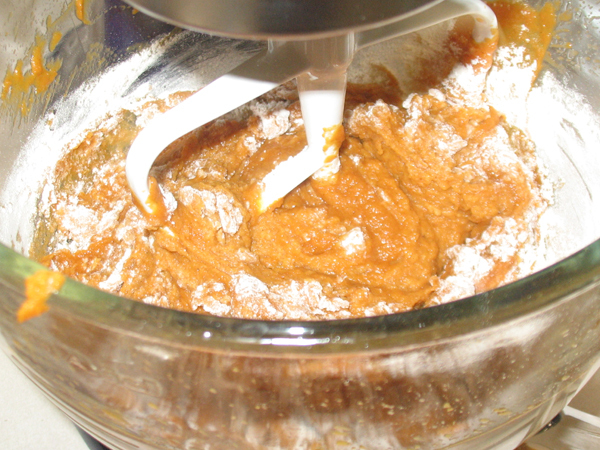 Make the icing by combining everything in one bowl. This is precise science, people. 10. 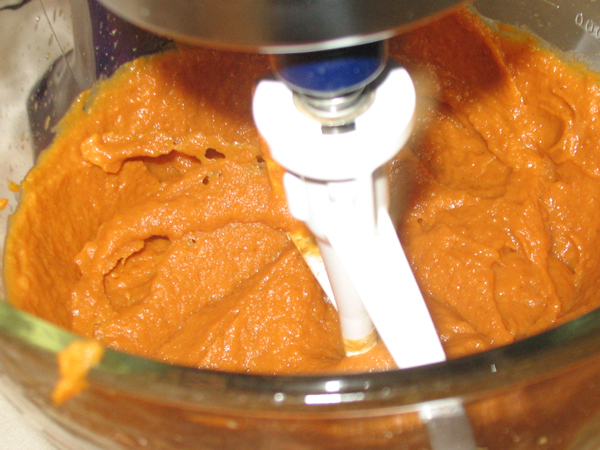 Use a knife to score a circle around the muffin tops and press the knife down, then lift up, and pry out the top. You will have a little muffin cone lid. Slice off the bottom part until you have a thin top remaining. 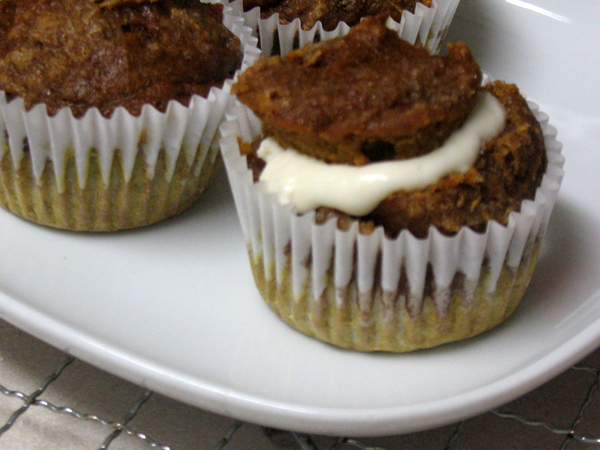 Now stuff that bad boy with cream cheese and replace the top. 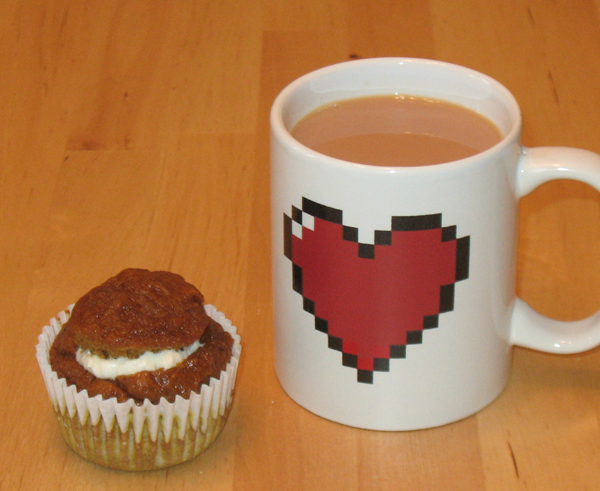 Verdict: They were good, but the muffin texture really changed overnight, they seem overly moist today. 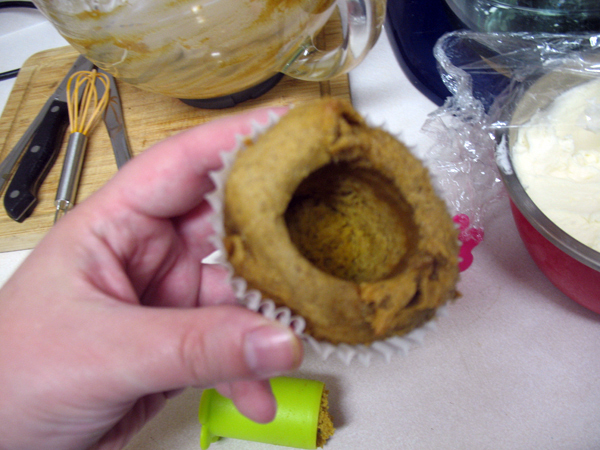 I tried one without icing, and the pumpkin was a bit too strong. 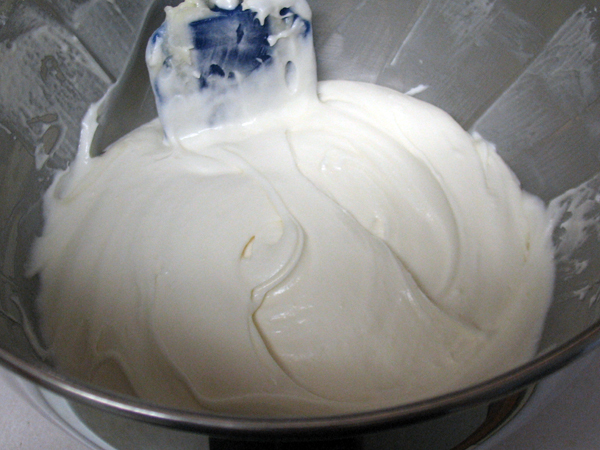 Then again cream cheese icing is also a very strong flavour, so… hard to say. I sent my friend home with one but forgot to ice it. Oops. Overall I was pleased with how it turned out, and I think for round 2 I’ll add a few more spices, and cut back on the pumpkin and see how that goes.